Nearly all forms of religion and magick use sacred plants and herbs for the purposes of purification. These plants might be sacred to a particular deity, or (more often) herbs were chosen for their known healing/purgative properties, for their pleasant odor, and/or for their folkloric uses in exorcism or driving away evil spirits. One or more such herbs are gathered together and used as an aspergillum to sprinkle holy water on objects and persons. Need maiden-spun thread to bind those herbs? Add 1yd of thread to your cart, then use coupon code ‘sprinklerthread’ at checkout for a 20% discount! 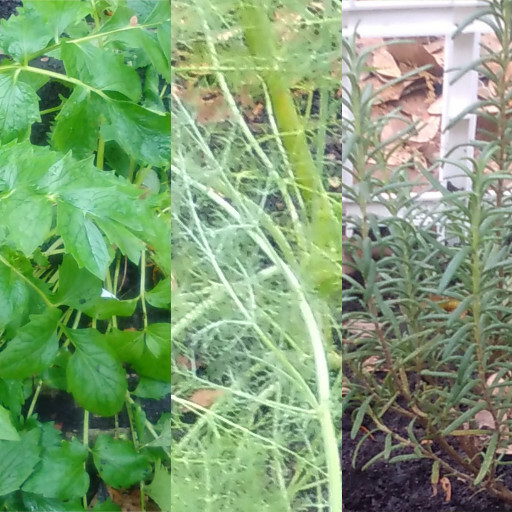 We grow all of our herbs at our home in Florida. We use no pesticides, choosing only diluted neem oil to protect them from insects and fungus. Otherwise our plants receive natural fertilizer/compost, Miracle Grow, and (when available) fresh rain water. And, of course, hands-on love and care as they grow. Lavender was used by ancient Romans to perfume their bath and laundry water. (Roman wash-women were known as Lavenders.) As such, it evolved an association with cleanliness. In later times, it was commonly strewn on church floors or burned to drive away evil spirits. Sage has a long history as a medicinal plant. It was used in the medieval era to treat fever, liver disease, epilepsy, and even cure warts. It was drunk as a general health tonic, and was believed to aid the memory. And to this very day sage is burned to chase away evil spirits and cleanse an area. Rosemary is an especially sacred herb – being associated with Mary and Aphrodite. It was often used as decoration at weddings, or given as gifts to wedding guests. It is said that a man who does not enjoy the scent of Rosemary cannot love, and he who smells it often will retain their youth. Rosemary also has healing and purifying properties – having been burned in hospitals to purify the air, hung over cribs to protect infants, and carried to ward off devils and the evil eye. Valerian: The Latin word “valere” means “to be strong/healthy.” Valerian is said to have the ability to turn anything bad into good. When the roots are used to make tea, it has a very calming effect – making it great for insomnia, anxiety, and other stress-related ailments. Unlike most other herbs used for Aspergillums, valerian root is known to have an unpleasant odor (often likened to old gym socks) – however that smell is not present in the leaves. Verbena – aka vervain – is another protective herb. It was worn around the neck to protect from snakes, vampires, headaches, and evil magick. Growing it in your garden is supposed to protect your house from weather damage and draw wealth. 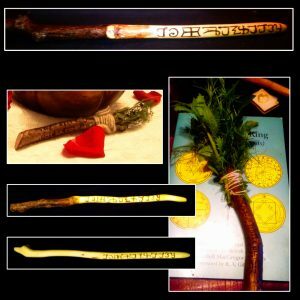 It has also been used in love and friendship spells, and is traditionally included in bridal bouquets to bring good fortune to the new couple. Legend has it vervain was used to staunch the wounds of Christ, and has had a reputation for healing ever since. Fennel brings strength and courage. Roman soldiers would chew fennel seeds before battle. British farmers would rub a concoction including fennel on their plows to strengthen the land and bring a good harvest. It is also protective: being hung over doorways for protection, and stuffed into keyholes to keep out ghosts. Finally, it also has properties of fertility – hence it was often thrown at newlyweds instead of rice. Basil is another herb of protection. It’s name means “King”, and also has relations to the word “Basilisk” – a dangerous creature that could bring about madness and death. It was worn or ingested to protect against attack, and could either protect from or cause madness. It was brewed into teas by witches to aid in flying (making it very likely a skrying herb), and could be carried to ward off evil spells and pests. Finally, it also has some relationship to love spells – being given to love interests, or set outside to indicate a young woman is accepting suitors. Spearmint: The many uses of mint are too numerous to list – just a few of them being protection, love, lust, rest/sleep, travel, success, prosperity, and transformation. All mints, and especially spearmints, are great general-use herbs to attract positivity, luck, and good spirits to a place. Peppermint: The many uses of mint are too numerous to list – just a few of them being protection, love, lust, rest/sleep, travel, success, prosperity, and transformation. Peppermint, especially, was used in the ancient world as a common food and wine flavoring – thus associating it with prosperity and abundance. Marjoram is a form of oregano – which means “Joy of the Mountains.” Shepherds would encourage their sheep to eat this plant to improve the taste of the meat. Oreganos are said to produce happiness, health, wealth, tranquility, success, etc. It was often made into wreaths worn by brides and grooms to ensure joy in marriage. It is used in various love spells as well, and its pleasant scent was often used by women as a deodorant. Growing it on your property can protect your home from harm, and carrying it on your person is also protective. Sorry, folks, we’re all tucked away for the winter!